Just looking at the building who would have thought there was something interesting at this corner? 2017: A London Inheritance has, yet again, published some interesting and informative photos. They prompted us to further investigate this corner. If you just want our conclusions jump to the paragraph that starts “Our reading of all this is …”. A c.1900 map shows the Victorian footprint of the buildings on this corner at that time. At Victorian Turkish Baths we found: “1911 Memorandum of Association: 25 April. Objects include: the purchase of the Imperial, Bedford, and Premier Hotels, and 'taking over the sites and completing the erection and equipment of the important extension of the "Imperial Hotel", including a Turkish Bath which it is believed will be the finest in London, now in the course of construction. '” As an aside, the name Walduck appears in the entry and, 2015, Richard Walduck OBE is listed as Head of the Imperial Hotels Group. This 1947 -64 map shows the corner after this development. Certainly the street frontages have not changed – the shops still exist but the layouts of 68, 69 and the Premier Hotel have changed. Elsewhere it is recorded that the Baths were constructed in 1913, which tallies. The London Inheritance photos show this corner in 1953 and confirm our reading of the 1947-64 map. The building looks to be mid/late Victorian, occupied by shops on the ground floor, this corner being Librairie Internationale Ltd., a bookshop-newsagents, possibly specialising in Communist / anarchist publications. The photos show that the ground at the entrance contains a decorative mosaic but one cannot decipher the image or text. These were a relatively common feature and would often give the name of the premises. Certainly the ground does not contain the ‘Turkish Baths Arcade’ sign currently there. The building in our photo, now a hotel with some shops below, dates from the 50s/60s and is large, stretching a long way back down Guilford Street. Our reading of all this is that: in 1911 the company that owned the Imperial Hotel (built only 4 years earlier) took over most/all of the neighbouring sites to the north and extended their hotel accommodation into those properties, leaving shops on most of the ground floors of the Victorian buildings, certainly at this corner. At the same time they constructed the Turkish Baths. The Arcade could have been constructed as part of this development, possibly at the join of the old hotel to the newly acquired blocks. The 1947-64 map shows a long thin entrance to the Premier Hotel (projecting forward of the building line) – could this be the Arcade? It’s probably at this stage that the mosaic sign was installed in the ground at the corner and it may have advertised the new Turkish Baths and Arcade. Then, shortly after the London Inheritance photos were taken, the hotel developed the site of their extension (possibly partly bomb-damaged) including the Victorian ones on this corner. They demolished all the existing buildings and put up the large modern block we see today, with the unusual columns of sharp, two-sided bay windows. 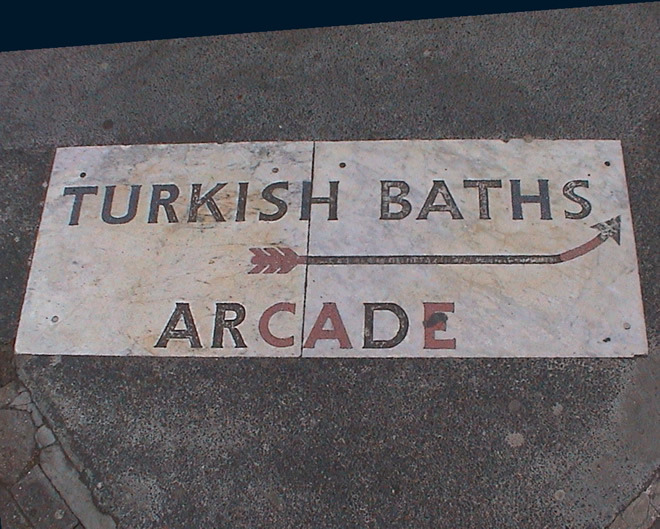 At this stage the Turkish Baths and Arcade still existed so they installed a consistent, modern sign in the ground, the one we see today. Certainly the sign could date from the 50s/60s. Possibly there was an entrance to the hotel on this corner and they needed to direct customers for the Baths to the Arcade entrance further south. That seems quite likely and the best explanation for the sign. And then in the late 60s the Imperial, together with its Arcade and Baths, was demolished and that section of the hotel rebuilt in a style which is a slightly updated version of its northern neighbour. 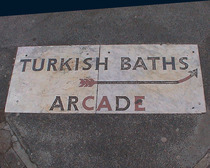 PS: Although no Turkish Baths exist on site, the Imperial Hotel still lists a ‘shopping arcade’ amongst its attractions.